COPYRIGHT © 2019 THE DARTMOUTH, INC. Recent polling shows Warren receiving single-digit support for the 2020 New Hampshire primary. CORRECTIONS We welcome corrections. If you believe there is a factual error in a story, please email editor@thedartmouth.com. landmark 1819 Supreme Court case that preserved Dartmouth’s status as a private college. In another unconventional presentation, Christiana Rose MA ’20 shared an interdisciplinary dance and acrobatic routine. Stanford neurosurgery professor Odette Harris ’91 reflected on a talk given by astronaut Mae Jemison that she attended during her senior year of college, as well as her own work as a doctor, professor and leader. “I was really looking forward to hearing Odette Harris’s talk, and I loved her presentation,” Woodstock Union High School senior Momo Biele said. “I’m hoping to go into neuroscience, so I found her really inspiring.” Jake Epstein ’21, a member of the Magnuson Center’s Student Leadership Board, was the only undergraduate speaker.Hespokeaboutthefundamentals of blockchain and its potential to create fairer and more equitable data access. The last talk belonged to Pete McBride ’93, who discussed his time in Grand Canyon National Park, during which he spent over a year documenting the park and highlighting the challenges it faces as outside developers push for a mega resort and tramway into the canyon. The conference was the second iteration of what Hsu and Suresh hope will become a long-standing tradition. Prior to 2018, Dartmouth last held a TEDx conference in 2011. Due to the inexperience of new leaders and the lack of returning membership, the conference did not continue, according to Hsu. “It’s kind of the perennial Dartmouth problem because of the way the D-Plan works and the weird way that classes interact [with one another],” Hsu said. “If you don’t build up a strong succeeding class it dies off. I’ve seen it happen with many organizations. Part of being an organizer is finding great underclassmen to help us because we don’t want this to be the last time.” Rachel Quist ’22, who was on this year’s TEDx team, said she hopes to stay involved and continue making future conferences a success. “I hope that both the community members and the Dartmouth students felt like TEDx was something they would definitely want to come back to again, and that it was definitely worth their time,” she said. our lesson, I hope.” Michael Gem, a New Hampshire native who lives in Los Angeles and is an undecided voter, echoed Hennessey’s general sentiments, saying that he would vote for anybody who can beat President Trump in 2020. On Warren, he said that while he is a “big fan of her message,” he is “not sure if she can win.” Jai Smith ’22, who attended the event, praised Warren’s grasp of policy details, saying that she answered questions “very directly, and with concrete things that she can do.” He added that Warren has been his favorite of the candidates he has seen so far. 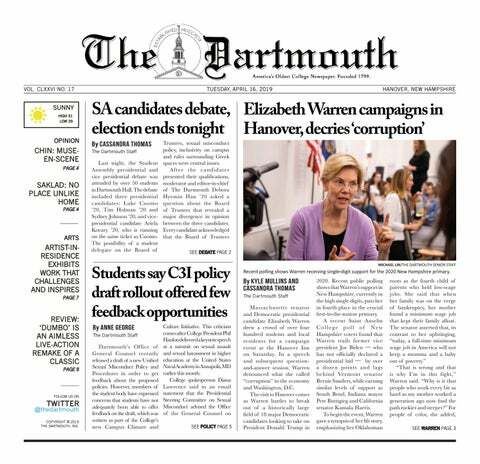 With the New Hampshire primary less than a year away, 2020 Democratic candidates are beginning to come in force to Dartmouth. Washington governor Jay Inslee and New York senator Kirsten Gillibrand ’88 recently visited campus, and Harris will be hosting a town hall event in Alumni Hall on April 23. Their visits are occurring on friendly territory — in recent elections, Hanover has proven to be a reliably Democratic town in a purple state. In the 2016 presidential election, Hillary Clinton received 84.9 percent of the vote in Hanover — her largest percentage of any town in New Hampshire. bodied women of color on Instagram, spoke out against Rhianna’s Savage X Fenty Valentine’s Day collection. She argued that the small to extra-large sizes had a more aesthetically appealing design than the full-coverage design of the collection’s 1X-3X sizes, and that larger women should also be able to bare more skin. Calling out fatphobia within the fashion industry has encouraged women to sit comfortably in their sexuality online, helping to remove the stigma from fat, stretch marks and scars. Magazines like Salty often feature non-normative bodies posing in traditional fashion shoot poses with bright lighting and fun pops of color. Body positivity calls for a more abstract way of thinking about the body. Abstractions of the body in cinema are good examples of a more critical take on body positivity. In Claire Denis’s most recent ﬁlm, “High Life,” the body is centered in its abject form. The camera shows a woman’s horriﬁed face as she lactates and realizes she is pregnant and, more abstractly, a woman’s head bursting as she approaches a black hole. These abstract images allow us to face the reality of trauma and fraught relationships with the body rather than gloss over the emotion of our bodies with brightly colored magazine pictures. In order to truly engage in body positivity, the term must not focus on literal aesthetics. Body positivity should not be reserved for the cover of fashion magazines. In the same way that body positivity has aﬀorded women of color, transgendered people and other marginalized bodies a feeling of pride, body positivity can help people cope with more ﬁgurative feelings of “ugliness.” Body positivity should be more than an Instagram hashtag. It should be a way to critique the world around you and situate it within your own life. ISSUE PETER CHARALAMBOUS & ANTHONY ROBLES SUBMISSIONS: We welcome letters and guest columns. All submissions must include the author’s name and affiliation with Dartmouth College, and should not exceed 250 words for letters or 700 words for columns. The Dartmouth reserves the right to edit all material before publication. All material submitted becomes property of The Dartmouth. 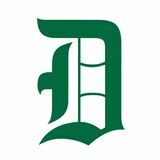 Please email submissions to editor@thedartmouth.com. counseling center and WISE that oﬀer support to victims, most victims’ experiences remain unheard by the college. In the barest terms, Dartmouth is not an institution that supports women. I am tired of that, too. So, I leapt into a world where I hoped to ﬁnd something diﬀerent from what I had known before. At the end of my ﬁrst week, a group of Brits and Scots celebrate a birthday at the Davies’ club. All night, I carry courses to the dining room in slow procession. Simone and Clinton gather me and Noah to tell us that we’ve done a “delightful job.” As the guests begin to ﬁlter out, they invite us for a drink. “I bet half the men in here went home and f—ed their wives after looking at you,” Clinton says in front of six other people, while winking at another man. I don’t know where to look, how to shape my face. He echoes the words girls hear from puberty and sometimes much younger. These kinds of words trick us into dressing up and make us regret it when we do. Frat boys whisper them into our ears in basements where they cannot even see our faces. I tried to escape these words by leaving Dartmouth, and I realize now they will follow me wherever I go. Clinton overstepped himself, but he also taught me that I will face harassment everywhere, not just at Dartmouth. I had similar experiences to mine in Touzac throughout my time traveling Europe. Men oﬀered me little gifts or called me beautiful and became angry when I turned them away. It feels so wrong to feel so lucky nothing worse happened to me. Countless women are assaulted or even killed while traveling abroad. People, mainly men, disrespect and harm women by taking their bodies for granted. But it does not have to be that way, and it should not be. In order for this to change, we will need, ﬁrst and foremost, an upwelling of empathy for other humans. That means considering the way our words and our actions aﬀect others. We cannot continue to tolerate men who disrespect women, who endanger our sense of safety and sometimes violate our bodies. The ﬁrst step to making the world a place where women can feel equal and safe is acknowledging harmful language and actions as well as starting conversations about diﬃcult topics like sexual harassment and assault. We cannot continue to skirt this topic. The movement will come slow and sometimes not at all, but we must move towards somewhere new. opportunity the hearing gives each party to ask each other questions. We think those questions would be hostile, judgmental or retraumatizing.” The current draft allows both parties to proffer questions for the hearing panel to ask; however, the panel has the discretion about which, if any, of the proffered questions it wants to ask. Lawrence added that the proposed hearing would only occur in limited situations, and a victim of sexual misconduct would never be required to confront or respond directly to the alleged perpetrator. “Our goal, as always, will be to promote a safe community that responds to situations with fairness and equity for all involved,” she wrote. However, following a meeting with some of the writers of the draft, Calcaterra said that the proposed live hearing might be excluded from the final policy. Calcaterra said that SPCSA also asked the College to work with Judicial Affairs to reach out to survivors and responding parties that are still on campus, as well as faculty who have worked with sexual misconduct cases in the past, to make them aware that the policy is being updated “because they are equipped to give feedback, have read this sort of language before, and have lived it.” She added that the policy contributors had responded to SPCSA’s request and said they would attempt to work with Judicial Affairs. Additionally, Calcaterra said that although they have the opportunity to respond through the feedback form, their experiences are being lost among the comments of “non-experts.” “My main concern is whether this protocol is more harmful to survivors than the old protocol,” she said. Lawrence emphasized that the College has the community’s interests in mind. “Dartmouth is committed to protecting the safety and well-being of everyone on our campus and we take the issue of sexual misconduct seriously,” she wrote. Guo	is	a	member	of The	Dartmouth	Staff. somebody who doesn’t know any of the candidates, I feel like you would get a sense of each candidate’s governing styles and how they would move forward in their roles.” Current president Monik Walters ’19 and vice president Nicole Knape ’19 were also present at the debate, and were frequently mentioned by the candidates. Walters said that she believes each candidate has the capability to become president. She said that although Johnson did not have the same Student Assembly experience as her competitors, she was still a qualified individual to run. Seminar: “Building an open source Python Ecosystem for Plasma Physics,” sponsored by the Department of Physics, Wilder Hall, Room 115. Lecture: “Korean Health Care System: Achievements and Challenges,” sponsored by the Nathan Smith Society, Carpenter Hall, Room 013. Reading: “Reading with author Namwali Serpell,” sponsored by the Department of English and the Society of Fellows, Sanborn Library, Sanborn House. Screening: “Samba Un Nombre Borrado, (“A Name Erased”),” Haldeman Hall, Room 41. TOMORROW 3:30 p.m. – 4:30 p.m.
Pets: “Visit from Winston, VT Therapy Dog,” sponsored by the Student Wellness Center, House Center B.
Lecture: “Dorsett Fellowship Lecture,” by Margaret Atwood, sponsored by the Ethics Institute, Hopkins Center for the Arts, Spaulding Auditorium. Film: “The Matrix,” sponsored by the Hopkins Center for the Arts, Black Family Visual Arts Center, Loew Auditorium. aiming for. Recently, Warner Bros. has relaxed the reigns on its artists and the results have been positive. “Aquaman” was a dumb but still a incredibly fun and visually stunning film. By trusting James Wan, — a director who had primarily made horror films prior to “Aquaman” — to do what he wanted with the film, DC was finally able to make a creative and entertaining movie. “Shazam!” is equally dumb but also incredibly fun, heartwarming and undeniably entertaining. Both movies have done great with audiences and have killed it at the box office, which fortunately means we’ll probably get a lot more films like it. The new direction of DC movies seems to ditch the forced grittiness of previous films and instead embrace the campy, oftentimes ridiculous nature of some of its superheroes. Personally, it’s a welcome change, and I hope DC continues this trend going forward. I had a great time with “Shazam!” and I can easily recommend it to anyone else looking to blow off some steam this week. Spring 2019 artist-in-residence Daniel Kojo Schrade, a professor of art at Hampshire College who has exhibited all over the globe, is offering Dartmouth students, faculty, staff and community members an extremely fresh show in the Jaffe-Friede Gallery this term. Schrade painted 80 percent of the works on display for his newest series, “:listenings.” “I’m really happy to take advantage of the amazing studio space and to have a show here in this very special gallery, which has extremely unique architecture,” Schrade said. Joining a rich history of artists who have participated in Dartmouth’s residency program, Schrade brought his perspective — which often focuses on liminality and the unlikely intersections of stories — to a campus that may need a reminder to stop and contemplate these concepts. “In this time of high-speed imagery, into the world of Schrade’s art. it’s special to have a slow thing like a “Each piece really has a space painting on the wall,” Schrade said. to breathe,” Schrade said of the The gallery, organization of which Schrade the gallery. The has adopted for “One of the benefits curving walls the term, is tucked of the unique art and sharp angles into a side of the of the room Hopkins Center residency program provide a bit of a for the Arts oft at Dartmouth is challenging area passed by students. to stage, however, that Schrade now The glass door, according to however, only has the freedom to Schrade. Yet, the shows the tip of experiment with the decision to hang the iceberg where the two largest Schrade’s work is continuation of the paintings back-toconcerned. back, suspended series.” Approaching in the center, the entrance, one afforded the works is struck by a large an important level painting free-hanging in the center of of separation that allows them to each the space, independent of any walls. The have their own impact. This inventive work’s bright, warm colors draw you in, organization allows students to consider and the bike-riding figure in the painting the subject matter’s translation into beckons you to move with the character artistic execution. “This is an exhibition that visually tries to connect central European poetry and history with African history, digging into the very early crossings with those histories,” Schrade said. “:listenings” is inspired by the work of a medieval German writer, Wolfram von Eschenbach, whose work Schrade connects with African history. In addition to common threads about the in-between spaces of the world, all of Schrade’s series are ongoing. For “:listenings,” which is only one year old, Schrade said, “This is really just the beginning.” One of the benefits of the unique art residency program at Dartmouth is that Schrade now has the freedom to experiment with the continuation of the series. As opposed to the traditional artistin-residence model, where the work an artist produces while on campus ends up being, according to Schrade, “usually very extravagant pieces,” the College’s residency flips the norm on its head. Beginning the term with his pre-made exhibition and a lecture, Schrade is now able to focus on meeting with students and being a guest lecturer in classes. Additionally, Schrade is able to create new work and experiment with varying materials. While living in Amherst, MA as a professor at Hampshire, Schrade said he has always been aware of Dartmouth and the Hood Museum’s importance within the region as a center of artistry. “It’s important if you’re in New England and interested in art … of course it was on my map, always,” Schrade said. The artist’s first visit to the Hood was in 2008, very shortly after he first moved to America. It is a “wonderful and generous residency,” Schrade said of the opportunity. For students passing by the gallery, Schrade encouraged drop-ins. “I hope people will take the extra minute,” said Schrade. grace and delicacy, the film either manner possible. Rather than growing ignores them or opts for blunt, easy organically from the story, they feel like answers. boxes that Kruger felt begrudgingly The story has largely been obligated to check. The result is invented from scratch, introducing neither thoughtful, progressive nor new characters, conflicts and settings. enlightened but, instead, intensely Yet screenwriter Ehren Kruger was insincere — none of which is helped still clearly instructed to shoehorn by a director who appears to be largely the more memorable moments from on autopilot. Tim Burton has made the original film into his adaptation, some genuinely spectacular films (“Ed which is precisely Wood”) and some h o w yo u g e t “Watching ‘Dumbo truly lackluster random scenes ones (“Mars that do nothing is like getting sucked Attacks!”). But to further the into a vaccum of only recently has plot and themes, his work started though they are nothingness and then to feel stale and given an immense spat out the other side uninspired. Even amount of weight 12 hours later having at his worst, Tim in terms of Burton’s work visual language. changed not one iota.” used to always Likewise, most of feel like it was the actors appear personal. While to be entirely lost, he became unclear about famous for what kind of performance would his film’s gothic atmospheres and be appropriate for this particular eccentric designs, his best work was film. Colin Farrell and child actors always grounded by a uniquely human Nico Parker and Finley Hobbins touch. I suppose the curse of fame is all try to play the material straight that now studios only appear to want as the protagonists, while Michael him for his skills as a “visionary.” Keaton overacts the villain with a Yet even the imagery in “Dumbo” is “go-broke-or-go-home” attitude. decidedly tame; even settings or set Each approach seems appropriate in pieces that should have appealed to different moments, but never together. Burton’s sensibilities on paper have Only Eva Green as an enigmatic been shot in the most generic manner trapeze artist seems suited for walking imaginable. the film’s utterly inconsistent tonal Watching “Dumbo” is like getting tight-rope walk. sucked into a vacuum of nothingness Even the direction and screenplay and then spat out the other side 12 seem uncommitted to any consistent hours later having changed not one thematic or narrative drive. Kruger’s iota. As a film, it is not just lost amidst a screenplay tries to shine a spotlight sea of theoretical, historical, thematic on cruelty toward animals, women and narrative tensions, but it is also in STEM and not selling-out to decidedly apathetic toward those a large, capitalist corporation. All tensions. “Dumbo” is not about the of these topics are worthy and “art of storytelling through motion” deserving of examination, but they are — it is about the art of lazy, sluggish incorporated in the most lazy, obvious and barely motivated corporate greed.